High inputs of nutrients, specifically nitrogen, is one of the major issues impacting Waquoit Bay and this projects ultimate goal is to help environmental managers predict how any future efforts to reduce nitrogen input could affect water quality and the entire ecosystem in the Bay. This project aims to improve our understanding of how plankton, both zooplankton and phytoplankton, in Waquoit Bay respond to changes in nutrient concentrations. We will be tracking changes in the plankton community composition and abundance relative to shifts in nutrient concentrations to analyze how quickly changes in nutrient inputs impact Waquoit Bay. A unique aspect of this project is the added focus on mixotrophs, a type of plankton that can photosynthesize and ingest prey. Mixotrophs are a potentially large portion of the plankton community, under certain conditions, and the study of how mixotrophs respond to changes in nutrient concentrations will provide a more complete understanding of how all plankton are affected by variability in nutrients. 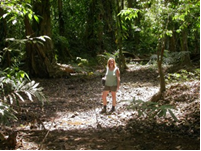 Nicole will join the Bay Watchers group during their planned sampling from May through September in 2018 and 2019. She plans to have some of the Bay Watchers help with the identification and enumeration of the phytoplankton samples using the WBNERR facilities. Microbial Community Composition of Permeable Reactive Barriers – Who Is Really Doing the Work? Description: Permeable Reactive Barriers (PRBs) are currently being tested at the Waquoit Bay Reserve as a potential partial mitigation strategy for nutrient pollution. The barriers are designed to remove nitrogen by promoting microbially-mediated denitrification but there has been no examination of the microbial community that is responsible for the removal of the nitrogen and no attempt to understand how those microbial communities might respond to future environmental change. This project will use molecular biology to examine how the barriers, and the periodic inundation of seawater, alter the structure and function of the microbial community. This information will help determine the best placement of the barriers to maximize their effectiveness. Understanding how the microbial communities in the two barriers differ and under what environmental conditions the denitrifying bacteria thrive will help to guide future barrier construction, particular in the context of rising sea levels. Description: Nutrient enrichment from septic systems is one of the most pressing coastal problems on Cape Cod. Towns are facing staggering costs for sewering and other solutions. 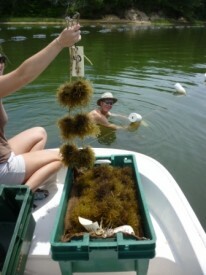 This project aims to investigate whether a native seaweed, Gracilaria tikvahiae, can be co-farmed together with oysters to both soak up nutrients and produce a marketable crop. As groundwater flows to the coast, it meets and mixes with seawater. Mixing between these two water bodies creates a dynamic region-the coastal aquifer – where nutrients are chemically and biologically transformed. The fate of nutrients from development is a key issue in coastal areas like Cape Cod so understanding the processes in this area is of great importance. 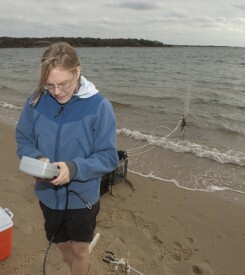 The mixing zone beneath Waquoit Bay was monitored for three years to observe how it changes with different seasons and responds to climate events such as the 2009-10 El Nino. The general goal for the project is to measure potential greenhouse gas (GHG) emissions and net CO2 uptake in coastal wetlands under a range of realistic nitrogen (N) loads and inundation (sea) levels. By meeting this goal, we aim to improve the information with which managers and policy makers can maintain and maximize ecosystem productivity, reduce harmful feedbacks of climate, and assess the potential for these ecosystems to enter C markets. We will examine how GHG emissions from salt marshes vary along an existing gradient of anthropogenic N loading in Waquoit Bay, MA (WB-NERR). 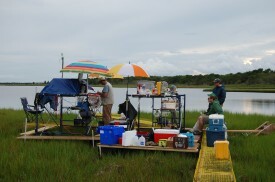 Further, we will test for relationships between N loads to the marshes and plant productivity. 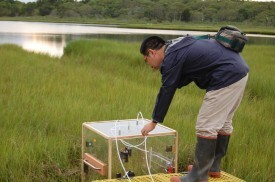 To investigate the influence of anticipated future increases in sea level, we will use existing gradients in marsh soil elevation (and therefore a gradient in soil water saturation and in frequency and duration of soil inundation) as a space-for-time substitution simulating future inundation of soils.